Cooking 4 Noobs: PACMAN Pot Pie! The 100 LIKE giveaway is here! Since the prizes are PACMAN themed, what better than to conjure up a PACMAN dish as well! Pac man is so cute and round... Makes me wonder what he will taste like? LOL Don't judge me. I think this recipe perfectly fits this little guy, since its a nostalgic game, this is a comfort food. Add onion; cook and stir 2 minutes or until tender. Cook 2 to 3 minutes, stirring constantly. Gradually stir in chicken broth and milk, cooking and stirring until bubbly and thickened. Stir in chicken and thawed mixed vegetables. 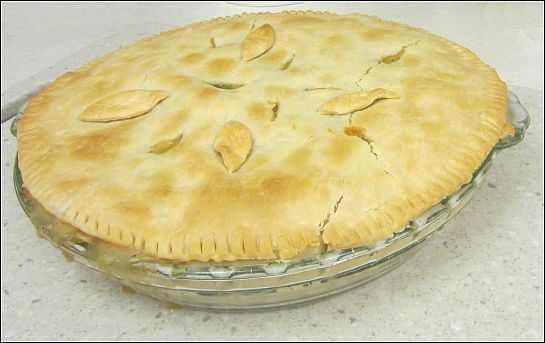 Spoon chicken mixture into crust-lined pie plate. Let stand 15 to 20 minutes before serving. And as Pacman would say: "WAKKA - WAKKA - WAKKA -WAKKA"